Citizen journalism is a practice that is in the process of adoption by newsrooms. The emergence of social media and digital platforms has only amplified the potential of the audience in journalism. This paper hypothesizes that digital platforms are important tools to citizen journalism: They can provide the data and financial resources that are needed to develop independent media. In order to prove such a theory, this research analyzes Arquitetura da Gentrificação, a Brazilian initiative that employs citizen journalism and data-driven journalism to discuss urbanistic problems in the city of São Paulo. The Internet has given the audience something that, until recently, was quite limited: interactivity. The Internet also provided them with the possibility to produce content and contribute to the circulation of information, making them so-called “prosumers” (Kotler, 2010). Through collaborative hypertext, in which weblogs and Wiki language are the most notorious representatives, the audience can produce and disseminate content without depending on any news media (Primo & Recuero, 2006). Blogs and Wiki webpages were the first steps, but the emergence of social media promoted the growing opportunity for users to produce their own content. This scenario is predictable by reading a comScore report2 (2014), a profile of Brazilian users in early 2014. According the research, Brazil continues to lead online engagement, with users browsing 29.7 hours per month—seven hours more than the world average. This country has the world’s fifth-largest audience, with 68.1 million unique visitors in February 2014, an 11% increase compared to February 2013. They remained online for 126,857 million minutes in 2014. These statistics show a very promising scenario for those who work in the virtual environment. However, they do not reveal whether or not such participation and time undertaken by users necessarily corresponds to the production of relevant content, which brings a good opportunity for media companies to propose to Internet users direct forms of collaborative (and relevant) enrollments. Newspaper companies have already tried some projects in order to promote this collaborative environment. Some of them are very simple; they ask the audience to send texts, photos, videos, and social media posts to contribute to specific reports or projects. Although they are valuable initiatives, newsrooms can amplify this participation by inviting users to contribute to issues of public interest, which are more relevant than the mere participation in a particular agenda. The present paper analyses a Brazilian project that uses the concepts of citizen journalism and data-driven journalism to investigate urban-related problems in one of the most economically important cities in Latin America: São Paulo. Arquitetura da Gentrificação3 is an independent and collaborative project in partnership with NGO Reporter Brazil. It produces a series of reports about the gentrification processes that occur, especially in the downtown area. In order to sustain this independency, the team chose only crowdfunding to obtain the financial support it needed. R1. Is it possible to make investigative reports without the active support of a large newspaper company? R2. Is crowdfunding a valid initiative to finance journalistic projects in Brazil? R3. Is the digital platform the best suited to the publication of broad and deep research, as presented by the Arquitetura da Informação project? In order to answer these questions, the methodology chosen for this research included analyses of texts, graphics, videos and other resources used in the project that are based on the theoretical framework presented in this paper. In addition, a telephone interview was conducted with the author of the project, freelance journalist Sabrina Duran, on December 8, 2014, so that she could clarify some particular aspects of the initiative. The popularization of computers and the Internet during the 1990s brought to light a new designation for those who navigate in the World Wide Web: users. They acquire the autonomy to read and to write as they want and, the most important thing, to create media, questioning issues such as authorship and linear reading, which are complex processes that have already been discussed by Barthes (1998) and Eco (2002). The Internet is a different media from the others because it enables the simultaneous and two-way communication between several people. … the phone conversation (1), (is) characterized by two-way communication between two or few people. TV and other means of dissemination (2) reach thousands of spectators, but the transmission has only one way, the transmitter “speaks” and receivers “listen.” With the World Wide Web (3) groups can chat using applications such as message boards, mailing lists or chat rooms. This is a simple summary of the evolution in communication processes. It also shows how information acquires a new level of importance in a networked society (Castells, 2002). Theoretically, there are no more boundaries of time and space regarding information (Levy, 1996). Information in Japan, Brazil, or Mexico can be accessed by anyone, anytime, and anywhere. Information circulates in an instantaneous and independent way and is also available to anyone who wants to access it. Further, it is free of charge (at least apparently). The free economy (Anderson, 2009) implies the feeling that free information is inherent in the virtual environment. Part of this preconceived concept is justified by Anderson (2009, p. 95) as a legacy of hacker culture that is based on seven principles, the most important of which is that all information should be free. This context creates an environment full of supplies and demands on free content in which users can choose what is (or is not) relevant to them and contribute to its circulation. These actions are not a privilege of some people or specific markets. It is an efficient distribution system that meets the demand of various sectors of the global economy. However, the aforementioned content is not something random or ordinary. Only relevant content can provide to or foster knowledge. This scenario creates a paradox in the information society: When the details are common or ordinary, they “want“ to be free. On the other hand, when information is more exclusive, it becomes valuable and people are willing to pay for it (Anderson, 2009). This paradox and the crises of current models for information and knowledge management promoted projects that focused on collective intelligence (Lévy, 1998), a distributed intelligence constantly reviewed and provided by the effective mobilization of skills. The collective intelligence considers that anyone can contribute in any subject, thereby increasing value to the network. The value is not only profitable; it can be social or cultural and influence the online and offline environments. These issues lead to other concepts: social capital and public space. Social capital may be conceptualized as a group-level attribute that reflects the character of the social relationships within the collective, and it is used as a basis to explain collective behavior. Coleman (1990) favors a collective good view of the social capital and defines it as a relational aspect of a social structure whose main function is to facilitate actions for those individuals who are within this structure. Similarly, Bourdieu (1986) regards social capital as an aggregate of the actual or potential resources that are provided to members of a social group by a network of relations. Social capital develops in a social system because closure, shared history, goal interdependence, and frequent interaction nurture a collective orientation. As a result, individual members’ access to resources is facilitated due to information connectedness, norms of reciprocity, and expectations of pro-social behavior. Conversely, anti-social behavior is visible, monitored, and eventually sanctioned (Faraj & Wasko, 2001, pp. 15-­16). The digital environment implies interaction and relationships, and goes beyond sharing information or participation. Because of this, social capital became an inherent practice of digital culture and provided changes in the public space. Habermas (1984) conceptualizes public space as a place of free debate between citizens in a universal and democratic way. Habermas (1984) also believes that, through this sphere, people are able to guide social actions—not by any internal or external coercive imposition, but as a democratic consensus provided by the rationality of actions and arguments. However, the public sphere should be an open forum for debate in which people can have equal access to arguments not influenced by power relations, dependence, authority, or social hierarchy. With the advent of the Internet, this space has changed and even has been extended. “The price of the positive increase of egalitarianism, with which the Internet offers to us, is the decentralization of access” (Habermas, 2006, p. 3). Every citizen is a reporter. With this slogan, the South Korean news OhmyNews was designed in February 2000 as a watershed in digital journalism. The breaking of the journalist paradigm as “keeper of the place of speech“ offered to the lay citizen (no journalism knowledge) all journalistic gear to give approval to its history: writing with editors in Seoul to ascertain information from the whole world and the endorsement a press mark transform a simple report of the accident at the corner journalistic fact. Also known as participatory, collaborative, or open source journalism, within citizen journalism the audience participates in the production of news and has an active role in collecting, analyzing, writing, and dissemination information—such functions were previously restricted to the media. In this case, the news is no longer the end, but the starting point of the communication role—promoting discussions, debates, and interactions (Gillmor, 2004). Citizen journalism is an important tool that promotes the reconfiguration of the public sphere because the media is no longer an instrument of private companies to stimulate public debate (Almeida, 1998; Castells, 2002, 2009). It invites the audience to interact in social debates. It also considers users, institutions, and public data as possible sources of news and articles; in other words, crowdsourcing. Crowdsourcing is outsourcing particular tasks to large, undefined groups of people to develop a new technology, process, or theory, or to analyze particular situations involving a large amount of data analysis. Other tasks may be crowdsourced and included in journalism. According to Trässel (2010), this process (crowdsourcing) is not new in journalism. Readers have always sent letters, photos, and messages to the newsroom. However, digital platforms amplified the audience’s participation in online and offline media as consequence of computer networks, changes in communication processes, and the file-sharing culture. In this new era, those involved in open source journalism may or may not be journalists, which can be another problem for journalism. Holanda (2007) states that it is a complex situation and demands a critical analysis that involves an ethical point of view and either a reminder to the newspaper’s commitments to the public and the advertisers since everyone can participate in the formulation of the news. In order to avoid it, media companies have to define the boundaries that will guide the audience’s collaboration in newsrooms. Trässel (2010) insists that audience participation is a constituent factor of data-driven journalism and the journalists should know to engage this audience. In order to engage the audience, journalists (and news media) should be more than gatekeepers; they must be gatewatchers. It means that they have to be content curators, using digital and human curation to attend to the public interest. In an attempt to provide a news media environment structured for audience participation, media companies have developed different projects. O Estado de S. Paulo,4 a Brazilian newspaper, publishes photos of readers in its printed version. Another journalistic project, VC Reporter,5 allows the users to send photos, videos, and texts through digital platforms. There were also projects that used collaborative platforms to obtain information for important issues, such as the Brazilian initiative SP + Clean6 and the iReport project 7 (CNN, in the United States). The first project began in April 2012 and its goal was to report all of the problems related to irregular waste disposal in São Paulo. In order to do so, both journalists and the audience took part in the project. The professionals wrote articles about this issue. The audience, on the other hand, helped with a specific part of the webpage entitled Mapa do Lixo (Map of Trash).8 In this interactive map, the audience could show parts of the city where there was improper waste disposal in three steps. They provide the location and the address (through a specific search engine, so they can identify the location on the map and “pin” it); register it (considering some information such as the name, comment, and the picture in the place that was initially indicated); and send the information. Through this map, the audience helped to identify more than 2,000 points of irregular waste disposal. iReport, in turn, invites the audience to participate in stories. The webpage presents the guidelines and, after completing a registration process, users can tell their stories by making statements about the main issue. However, this is not the only form of participation. After registering, the audience can interact with each other, contributing in other articles or simply talking about issues of common interest. However, all of these collaborative journalistic projects belong to powerful media companies. It means that they follow already-established editorial guidelines and have boundaries to the audience’s participation. There is, therefore, an alternative way to conduct an independent journalistic project that is focused on the public interest and without any advertisers’ interference: crowdfunding. Crowdfunding is the practice of funding a project by raising monetary contributors from among a large number of people, typically via the Internet.9 This practice provides financial support to many projects, including those in journalism. According Startupi,10 Kickstarter, a global crowdfunding platform, received $480 million for projects in 2013, which signifies an increase of 50% over 2012. Catarse (2014), a Brazilian crowdfunding platform, generated R$7.6 million ($2.9 million)11 in 2013. In Brazil, one of the few projects that achieved the parameters listed above was Arquitetura da Gentrificação (Architecture of Gentrification).12 In order to understand this project, it is necessary to comprehend the impact of crowdsourcing and crowdfunding in Brazilian projects and how citizen and data-driven journalism works in Brazil. AG1: journalistic research on the social sanitary processes in public areas in downtown São Paulo. AG 2: a specific investigative report based on a document signed by São Paulo city and a private bank for the revitalization of Vale do Anhangabaú, located in downtown São Paulo. According to Stake (2008), there are three types of case studies, which are categorized by purpose: (1) an intrinsic case study is undertaken because of an intrinsic interest in the particular case; (2) an instrumental case study is analyzed to provide insight into an issue; (3) the collective case study helps to investigate a phenomenon or general condition. This research employs an intrinsic interest in a particular case and it was not so much a methodological choice as it is a choice of what is to be studied (Stake, 2008). Although the initial goal was to investigate only the last two municipal administrations, during the investigation for the project, journalists decided to extend the scope to the current administration of São Paulo city. In order to understand these stages, the official pages of the project were analyzed over three months, from October to December 2014. NGO Reporter Brazil hosted both webpages. Using Habermas’ public sphere as a framework, this research considered journalistic processes (data-driven journalism), digital platforms used in the project (sites and social networks), crowdsourcing and crowdfunding in order to verify if they contributed to participation and public debate in São Paulo. In addition, a telephone interview was held on December 8, 2014 with journalist Sabrina Duran, author of the AG project, with the following objectives: to understand how journalistic investigation was conducted; to understand the choice of digital tools used in the project; to analyze the collaborative process of AG; and to understand the model of financial sustainability of the AG. According to Berger (2011), interviews are used in social inquiry to discover information about past activities, motivations, thoughts, opinions and attitudes. Then, this data must be collected and transcribed into texts, so the researcher can establish a framework for data analysis and interpretation in order to understand the qualitative evidence (Lindlof & Taylor, 2011). Therefore, AG was chosen and studied using the purposive sampling technique described as convenience sampling (Lindlof & Taylor, 2011). Each sample met the following themes: (1) a large amount of data and difficulty in adapting them to the traditional journalistic practices in the online environment; (2) investigative and independent journalism practices in the digital environment; (3) social media and online journalism in Brazil. The idea for the project began in December 2012 when Sabrina Duran16 returned from the United States. When she moved to U.S., she had to leave the apartment where she lived, and when she returned, she found it hard to get a new property in the same region due to high rental prices and limited options in the downtown area. The investigative journalistic process involved in the project was different from traditional newsrooms. There were no deadlines, pre-defined guidelines, or specific sizes and formats for news presentation. The interview requests took weeks to be answered, if there even was an answer. The large amount of data also contributed to the report’s size. It was a different project that required a different approach. The article “Housing PPP: partnership between the state government of São Paulo and real estate capital threat to the middle class,”18 posted on December 6, 2013 and updated on December 12, 2013 is an example of that approach. It comprises 11 chapters and took five months to be investigated. The report has texts, a video, nine images (including graphics and other types of illustration), 16 pictures, and three audio files. In order to prevent overloading of the webpage, the audience can download a PDF file with all the content. Besides this PDF file, there are hyperlinks to access all the documents and interviews done during the investigation, as well as an index (hyperlinks) to access each chapter. Therefore, users could collaborate and interact by using social media (Twitter and Google+) and hyperlinks provided by the authors in the texts. Due to the complexity of the matter investigated and portrayed in the article, both authors provided hyperlinks that could help users to understand the issue as well as check out other points of view on the subject. Thus, the user was not limited to data provided by the project. Another aspect highlighted by the journalists is that the project challenged the specificities of online journalism. These complex issues exist in both phases of the project, and that was the reason why the AG team had to protect themselves from potential lawsuits. To prevent these problems, they submitted all the reports to lawyers, architects, the NGO Article 19,21 and an editorial board. The reports were published only after consultation with all involved. In addition, Sabrina Duran used another resource to protect them from potential lawsuits and expose the project in a collaborative context of free access to information: all files used in the preparation of reports were available to download. Thus, interested parties can access the full documents and audio and video files used to make the reports. In order to facilitate the access and sharing of information, AG has social media accounts with Facebook, Twitter, YouTube, and Google+. In addition, the first phase of the project also has a blog. Although the two phases of the project have similarities, such as journalistic investigation processes, an open access policy, and financial support via crowdfunding, each phase had particular aspects to be considered in the content analysis. AG began in early 2013. All the investigations resulted in a website, hosted on the NGO Reporter Brazil webpage, divided into six parts:23 Articles, Blog, References, Contact List, Supporters, and Contact (see Table 1). All of them are very interactive and collaborative, so users can provide data and spread information about AG project. The report’s labels were defined according to the main issue subject and were divided into “All,” “Sanitation,” “Resistance,” “Occupations” and “Crossed Data” (see Table 2). They were selected according to the most recurring themes encountered in the project. Over more than a year, AG produced 14 reports with photos, illustrations, video, and/or audio files (see Table 3). All of them provided to users important tools to understand the issues and spread the information in digital environment. All material have sharing icons through social media (Twitter and Google+, located on the top of the page), and videos can be shared via YouTube. The reports contain tags at the bottom of the webpage to identify their main issues. There were 78 tags used in AG, an average of 5.57 for each report. From this total, only 15 tags were in more than one report, which includes the tags “Favela do Moinho” (three times) and “PPP de habitação do centro“25 (four times). “Right to the City: report brings suggestions of public policies against gentrification”27 published on January 14, 2014, for example, shows the possibilities in digital platforms used by AG team. The text was written by Sabrina Duran and featured graphics and layout by Luana Bola, a collaborator. In this report webpage, at first, viewers can see the title and a summary of the main subject, which explains what is it all about. Also, the webpage has a hyperlink to download the report in PDF format as well as a text that emphasizes that the material is free for reproduction, distribution, and printing. Therefore, all sources used in the research are listed and available on each page of the PDF file. According to Downey and Fenton (2003), alternative media and new media can help create a “counter-public sphere” and encourages citizens to “analyze how shared democratic values and identification as democratic citizens are achieved and maintained” (p. 191). However, digital media was not only a platform used to share information. It was also an important tool for data analysis. Half of the reports at this phase were based on data-driven journalism parameters using human and digital curation to display content obtained after their research. The article “The contractor bench”28 is an example of the curatorial process conducted by the AG team. It was published on September 18, 2013, and highlighted an interactive infographic that shows the connections between the buildings in São Paulo, the contracts with these companies, the money donations made by them, and their relations to politicians. The team set up the infographic according to information presented in online spreadsheets. All the documents and spreadsheets used to design the infographic are available for download or online consultation, with a team invitation for users to use those data to do their own analysis. Although digital platforms have importance to the project, the human factor was not forgotten. In order to humanize the content, the AG project tried to stimulate its audience to collaborate through testimonials from residents and photographic records. One of these initiatives was the development of a collaborative map for residents of Favela do Moinho.29 Released on March 3, 2014, the map is still in Beta version. It takes only a simple registration (with login and password) for residents to be able to complain about problems in the favela. Complaints are labeled as violation of the right to housing, lack of basic sanitation, or fire in the Moinho.30 This choice is not random. According to Ministério das Cidades31 (2012), the habitation deficit in São Paulo state is 1.320.000, which explains the high number of citizens living in precarious conditions in the city. In addition, Brazil occupies 112th position in a ranking of 200 countries in global sanitation.32 This means that only 48.1% of Brazilians have sewage disposal service and only 37.5% of the country’s sewage is treated.33 The third item is justified because Favela do Moinho has a high rate of fires compared to other favelas in São Paulo. It also has one more category: “historical registry of Moinho,”34 whose objective is the registration of residents in order to show the human side of the area’s living conditions. However, the tool is not as effective as it was intended to be. There was low compliance by the locals. According to Duran,35 technological ignorance and lack of technical capacity on the part of the residents were the main reasons for that. Phase two of the project was called Privatization of the Streets.37 The idea for its realization came at the end of the first phase of AG, when a source told journalist Duran about a donation agreement signed by the mayor of São Paulo and Itaú, a private bank in Brazil. This document allowed the private bank to be in charge of the revitalization process in Vale do Anhangabaú in downtown São Paulo. The tip led to a journalistic investigation that took one year (December 2013 to December 2014) and resulted in a website and a documentary, which was expected to be released in early 2015. Although the issue of gentrification is still present in this phase of the project, there are differences regarding the focus of reports. Thus, it is easy to foresee changes to the layout of the webpage and information architecture. In order to do AG2, the team consulted over 30 sources and 40 documents, such as contracts, meeting records, and bidding processes. As with AG1, all the material used during the investigation is available for consultation and downloading. 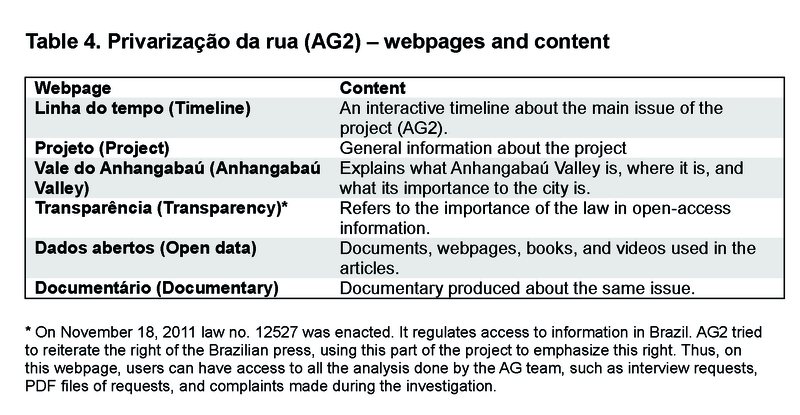 The reports were divided into: Timeline, Project, Vale do Anhangabaú, Transparency, Open Data, and Documentary38 (See Table 4). In AG 2, the texts are shorter and do not have tags or release dates. There were six reports, two photos, and 12 videos that helped to understand how the process of revitalizing Vale do Anhangabaú was determined. AG2 also developed a timeline41 in order to help the audience understand the facts that led to São Paulo City Hall’s decision. Through this timeline, the audience can access texts and images that explain the process investigated by the professionals. Crowdfunding was the only choice the AG team had to obtain the financial support for the project. However, the practice was not enough to support it. The absence of typical features of traditional newspapers, such as ad sales, led the team to improvise in order to keep the project alive. Thus, the collaborative process was once again the resource used by the team responsible for the project. This statement can be supported by some data presented by Departamento Intersindical de Estatística e Estudos Socioeconômicos (Dieese),45 a Brazilian research institution. São Paulo is one of the most expensive cities in Brazil. In 2014 it had a cost of living rate increase of 6.18%, and the costs that contributed to this were education, personal expenses, superficial expenses, food, and housing. The reason why innovation often seems to be so difficult for established newsrooms is that, though they employ highly capable people, they are working within organizational structures whose processes and priorities were not designed for the task at hand. Creating an innovative newsroom environment means looking within the existing value network and beyond traditional business models to discover new experiences for audiences, then realigning your resources, processes, and priorities to embrace these disruptions. While there is no single panacea to replace the traditional business models that news organizations relied upon for more than a century, these recommendations taken in aggregate provide a framework for an emergent strategy to take hold (focus on the job to be done). Innovation requires courageous leadership, a clearly articulated vision, and strength to stay the course. Thus, digital platforms are important tools that provide opportunities for collaboration, data collection, and project financing, including in journalism. Arquitetura da Gentrificação found problematic issues in Brazilian society that were (partially) ignored by society and the press. The project used data analysis and interviews to develop an independent journalistic media. The AG team has been successful in its investigation and reports, but that does not mean that the path was easy. The power relations that limit the journalistic processes can sometimes be helpful during an investigation. Therefore, there are some issues that need to be considered: if the AG project was supported by a well-known newspaper company, there would be more resources, including financial resources. The journalists could work faster and the material would have more visibility. On the other hand, some of the issues could be censored or abandoned, as they might interfere in delicate matters within these companies, such as advertisers and politicians. Crowdfunding guaranteed this supposed freedom for AG despite the fact that the financial resources weren’t enough to support all the project’s needs. There was unlimited space and possibilities for the journalistic content. There was no deadline. There was no commercial pressure. Moreover, AG was developed by independent journalists. The investigation process was slow, it took weeks to obtain access to information, and it was not always easy. Usually NGOs had to interfere in order to access data or get interviews. Using crowdsourcing, crowdfunding and data driven journalism, the AG project created a public forum and facilitated discourse, reinvigorating the liberal ideal of the public sphere as defined by Habermas (1984, 2006). The author sincerely thanks Centro Universitário Estácio Radial de São Paulo for its financial support. She also wishes to thank Sabrina Duran and her colleagues at Senac-SP and IPOG. 1.Available at: http://www.nielsen.com/us/en/insights/news/2012/buzz-in-the-blogosphere-millions­more-bloggers-and-blog-readers.html. Accessed on: November 15, 2014. 2.Available at: https://www.comscore.com/por/Insights/Press-Releases/2014/5/Estudo-da­comScore-Brazil-Digital-Future-in-Focus-2014-esta-disponivel. Accessed on: November 15, 2014. 3.Author’s translation from a Portuguese title: Gentrification Estructure. Project available at: http://reporterbrasil.org.br/gentrificacao/. Accessed on: October 10, 2014. 4.Available at: http://www.estadao.com.br/. Accessed on: November 15, 2014. 5.Available at: http://vcreporter.terra.com.br/. Accessed on: November 15, 2014. 6.Author’s translation from original Project SP + Limpa. Available at: http://g1.globo.com/sao-paulo/sao-paulo-mais-limpa/index.html. Accessed on: November 15, 2014. 7.Available at: http://ireport.cnn.com/. Access on: November 15, 2014. 8.Author’s translation from original title. Available at: http://g1.globo.com/sao-paulo/sao-paulo-mais­limpa/index.html. Accessed on: November 15, 2014. 9.Available at: http://en.wikipedia.org/wiki/Crowdfunding. Accessed on: October 10, 2014. 10.Available at: http://startupi.com.br/2014/01/crowdfunding-ainda-cresce-kickstarter-arrecadou-us­480-milhoes-em-2013/. Access on: November 15, 2014. 11.Author’s calculation based in Brazilian exchange rate. Available at: http://economia.uol.com.br/cotacoes/cambio/dolar-comercial-estados-unidos/. Accessed on: December 11, 2014. 12.Author’s translation from a Portuguese title. Project available at: http://reporterbrasil.org.br/gentrificacao/. Accessed on: October 10, 2014. 13.Reporter Brazil was founded in 2001 by journalists, social scientists and educators in order to promote reflection and action on the violation of the fundamental rights of people and workers in Brazil. Because of its work, it has become one of the most important sources of information on slave labor in the country. Reports, journalistic investigations, research and educational methodologies have been used by the government leaders, the business sector and civil society as instruments to combat modern-day slavery, a problem that affects thousands of people. Available at: http://reporterbrasil.org.br/quem-somos/. Accessed on: October 10, 2014. 14.The original citation: O Arquitetura da Gentrificação (AG) é um projeto de investigação da jornalista Sabrina Duran realizado em parceria com a Repórter Brasil sobre as medidas de higienização social adotadas durante as duas últimas administrações municipais de São Paulo (2005-2012) no centro da capital. Como foco principal da investigação estão as relações entre poder público e empresas privadas do setor de construção civil e ramo imobiliário. Por meio de um conjunto de reportagens que abordam diferentes faces do mesmo tema, o AG pretende apresentar um panorama capaz de explicar como se dá o processo de gentrificação, seus atores, impactos causados e possíveis formas de resistência da sociedade civil. Trata-se de um projeto de investigação com um recorte específico, tanto temático quanto temporal, e que tem início, meio e fim. Available at: http://reporterbrasil.org.br/gentrificacao/sobre/. Accessed on: October 10, 2014. 15.The original citation: O “Privatização da Rua” (ou AG2) é a segunda fase do projeto Arquitetura da Gentrificação, feito em parceria com a Repórter Brasil. Trata-se de uma investigação jornalística iniciada em dezembro de 2013 e concluída em dezembro de 2014 com o objetivo de destrinchar os processos por trás do plano da prefeitura de São Paulo de “requalificar” o centro da cidade, especificamente o Vale do Anhangabaú e adjacências. Os planos de requalificação estão inseridos no contexto do projeto “Centro, Diálogo Aberto”,” da Secretaria Municipal de Desenvolvimento Urbano (SMDU). Ao longo de um ano de investigação, a reportagem identificou que o banco Itaú, apresentado pela prefeitura como financiador no projeto, não foi apenas quem pagou por ele. A instituição financeira atuou com autonomia e protagonismo no âmbito da administração municipal, dispondo de ferramentas públicas de gestão, idealizando e definindo novos usos do espaço público, procurando dar a este um caráter marcadamente comercial, desconsiderando, portanto, as populações vulneráveis que historicamente ocupam o centro de São Paulo. Available at: http://reporterbrasil.org.br/privatizacaodarua/s.php?page=projeto. Accessed on: November 15, 2014. 16.From an interview by telephone with the author on December 8, 2014. Sabrina Duran is a freelance journalist since 2009. Her current focus is on AG project. One of his main collaborators is Fabricio Muriana, publicist and philosopher, who joined the project in August 2013. Besides them, there are three fixed employees and five sporadic employees, including some of them work in the NGO Reporter Brazil. 17.From an interview by telephone with the author on December 8, 2014. 18.Author’s translation from Portuguese title: “PPP de habitação: parceria entre governo estadual de SP e capital imobiliário ameaça até a classe média.” Available at: http://reporterbrasil.org.br/gentrificacao/ppp-de-habitacao-parceria-entre-governo-estadual-de-sp-e-capital-imobiliario­ameaca-ate-classe-media/. Accessed on: October 10, 2014. 19.From an interview by telephone with the author. 20.From an interview by telephone with the author. 21.Artigo 19 is a NGO, which works for all anywhere can express themselves freely, to access information and enjoy freedom of the press. They understand the freedom of expression as three things: Freedom of expression is the right to rule; Freedom of speech is freedom of the press; Freedom of expression is the right to know. Original statement available at: http://artigo19.org/blog/quem-somos/. Accessed on: December 9, 2014. 22.From an interview by telephone with the author. 23.Author’s translation from Portuguese terms: Reportagens, Blog, Referências, Lista de Contatos, Apoiadores, Contato. 24.Author’s translation from Portuguese title: Residentes da Favela do Moinho denunciam excessos da polícia. Available at: http://reporterbrasil.org.br/gentrificacao/moradores-da-favela-do-moinho­denunciam-excessos-da-policia/. Accessed on: October 10, 2014. 25.PPP de habitação do centro is a public-private partnership for the construction of new buildings in the center area of São Paulo city. Available at: http://www.habitacao.sp.gov.br/casapaulista/ppp_centro_sao_paulo.aspx. Accessed on: October 10, 2014. 26.From an interview by telephone with the author. 27.Author’s translation from Portuguese title: “Direito à cidade: reportagem traz sugestões de políticas públicas contra a gentrficiação.” Available at: http://reporterbrasil.org.br/gentrificacao/direito-a-cidade-reportagem-traz-sugestoes-de-politicas-publicas-contra-a-gentrificacao/. Accessed on: October 10, 2014. 28.Author’s translation from Portuguese title: A bancada empreiteira. Available at: http://reporterbrasil.org.br/gentrificacao/a-bancada-empreiteira/. Accessed on: October 10, 2014. 29.Author’s translation from Portuguese title: Mapa colaborativo denuncia violência contra moradores da Favela do Moinho. Available at: http://reporterbrasil.org.br/gentrificacao/mapa­colaborativo-denuncia-violencia-cometida-contra-moradores-da-favela-do-moinho/. Accessed on: October 10, 2014. 30.Author’s translation from Portuguese terms: violação do direito à moradia; falta de saneamento básico; fogo no moinho. Available at: http://reporterbrasil.org.br/gentrificacao/mapa-colaborativo­denuncia-violencia-cometida-contra-moradores-da-favela-do-moinho/. Accessed on: October 10, 2014. 31.Available at: http://www.cidades.gov.br. Accessed on: December 10, 2014. 32.Available at: http://www.tratabrasil.org.br/ranking-do-saneamento. Accessed on: December 10, 2014. 33.Available at: http://g1.globo.com/sao-paulo/noticia/2014/02/universalizar-saneamento-basico-em­sp-exige-r-35-bilhoes-diz-estudo.html. Accessed on: December 10, 2014. 34.Author’s translation from: registro histórico do Moinho. Available at: http://reporterbrasil.org.br/gentrificacao/mapa-colaborativo-denuncia-violencia-cometida-contra-moradores-da-favela-do­moinho/. Accessed on: October 10, 2014. 35.From an interview by telephone with the author. 36.Available at: http://reporterbrasil.org.br/privatizacaodarua/. Accessed on: November 15, 2014. 37.Author’s translation from Portuguese title: Privatização da rua. Available at: http://reporterbrasil.org.br/privatizacaodarua/. Accessed on: November 15, 2014. 38.Author’s translation from Portuguese titles: Linha do tempo, Projeto, Vale do Anhamgabaú, Transparência, Dados abertos, Documentário. Available at: http://reporterbrasil.org.br/privatizacaodarua/. Accessed on: November 15, 2014. 39.Author’s translation from Portuguese titles: Documentos públicos, Áudios, Vídeos, Imagens, Transcrições, Bibliografia de apoio. Available at: http://reporterbrasil.org.br/privatizacaodarua/s.php?page=dadosabertos. Accessed on: December 1, 2014. 40.Available at: https://www.youtube.com/watch?v=wGReZgvDq3s&list=UU_F8X3SKXwkA7KHOGnAFtvw. Accessed on: December 1, 2014. 41.Available at: http://reporterbrasil.org.br/privatizacaodarua/. Accessed on: December 1, 2014. 42.Available at: http://catarse.me/pt/projects. Accessed on: December 9, 2014. 43.In dollars: The AG1 was aimed to obtain $ 6,844. It reached $ 7,649 and had 316 supporters. The AG2 had a goal to get $ 13,169; obtained $ 14,044 and had the support of 194 people. The financial difference between the first and the second phase was the donation of $ 2,661 from a foundation. Author’s calculation based in Brazilian exchange rate. Available at: http://economia.uol.com.br/cotacoes/cambio/dolar-comercial-estados-unidos/. Accessed on: December 11, 2014. 44.In dollars: The first phase of the project yielded approximately $ 2,281 per employee. If we divide that $ 2,281 per 365 days a year, would give $ 6 per day to live in one of the cities with the most expensive standard of living in South America. Author’s calculation based in Brazilian exchange rate. Available at: http://economia.uol.com.br/cotacoes/cambio/dolar-comercial-estados-unidos/. Accessed on: December 11, 2014. 45.Available at: http://www.dieese.org.br/analiseicv/icv.html. Accessed on: December 9, 2014. 46.From an interview by telephone with the author. Almeida, J. (1998). Mídia, opinião pública ativa e esfera pública democrática. IV Congreso Latinoamericano de Ciencias de la Comunicacións(IV ALAIC). Anderson, C. (2009). Free. Rio de Janeiro, Brazil: Editora Campos. Barthes, R. (1998). O efeito de realidade. In: O Rumor da Língua. São Paulo: Brasiliense. Berger, A. A. (2011). Media and communication research methods. Thousand Oaks, CA: Sage. Castells, M. (2002). A sociedade em rede: a era da informação – economia, sociedade e cultura. São Paulo, Brazil: Paz e Terra. Castells, M. (2009). Comunicación y poder. Madrid, Spain: Alianza. Catarse. (2015). Tire seus projetos do papel! Retrieved December 9, 2014 from http://catarse.me/pt/projects. Coleman, J. (1990). Foundations of social theory. Cambridge, MA: Harvard University Press. Downey, J., & Fenton, N. (2003). New media, counter publicity and the public sphere. New Media & Society 5, 185-202. Eco, U. (2002) Lector in fabula. A cooperação interpretativa nos textos narrativos. 2a ed. São Paulo, Brazil: Perspectiva. Habermas, J. (1984). Mudança estrutural da esfera pública: Investigações quanto a uma categoria da sociedade burguesa. Rio de Janeiro, Brazil: Tempo Brasileiro. Habermas, J. (2006). O caos na esfera pública. Folha de S. Paulo, disponível em: http://www.lainsignia.org/2006/septiembre/cul_003.htm [consultado a 02 de Maio 2009]. Holanda, A. (2007). Estratégias de abertura: O jornalismo de fonte aberta dos casos Indymedia, CMI, Slashdot, Agoravox, Wikinotícias e Wikinews. UFBA. Lévy, P. (1996). O que é o virtual? Rio de Janeiro, Brazil: 34. Lévy, P. (1998). A inteligência coletiva. São Paulo, Brazil: Loyola. Lindlof, T. R., & Taylor, B. C. (2011). Qualitative communication research methods. Thousands Oaks, CA: Sage. Primo, A., & Recuero, R. (2006). A terceira geração da hipertextualidade: Cooperação e conflito na escrita coletiva de hipertextos com links multidirecionais. In: Líbero, ano IX, n. 17. Spyer, J. (2007). Conectado. O que a internet fez com você e o que você pode fazer com ela. Rio de Janeiro, Brazil: Jorge Zahar. Trässel, M. (2010). A apuração distribuída como técnica de webjornalismo participativo. Produção e Colaboração no Jornalismo Digital. Editora Insular. Soraia Herrador Costa Lima de Souza is a journalist, consultant and professor of digital media at the Centro Universitário Estácio Radial de São Paulo, Centro Universitário SENAC-SP and Instituto de Pós-Graduação (IPOG). Most recently, she is a doctoral student in information science at Universidade de São Paulo.